When Go Ahead Tours staffer Miriam set out on our tour Food & Wine: Beers of Belgium & Germany, she expected to taste some pretty amazing treats—like Belgian chocolates and German pretzels. But, during a cooking class with her group, she tried her hand at making tomate aux crevettes, a fresh shrimp and tomato dish from Belgium that’s popular across Benelux. The recipe quickly became a new favorite meal. “It was delicious—I liked it so much, I ended up ordering it at a restaurant the next day!” she said. Ready to taste the Belgian treat at home? Try the recipe Miriam shared below! Cut off the tops of the tomatoes and save to use as lids. With a spoon, scoop out as much of the inside of the tomatoes as possible, creating a bowl. Place the tomatoes upside down on a tray and set aside. In a small bowl, mix the egg yolk with mustard and whisk thoroughly. Add a pinch of salt and pepper, then let rest 3 minutes. Add the oil a little bit at a time, whisking until the dressing thickens and starts to look glossy. Add lemon juice and adjust seasoning to taste. Combine the dressing with the shrimp and parsley in a large bowl, folding until coated evenly. 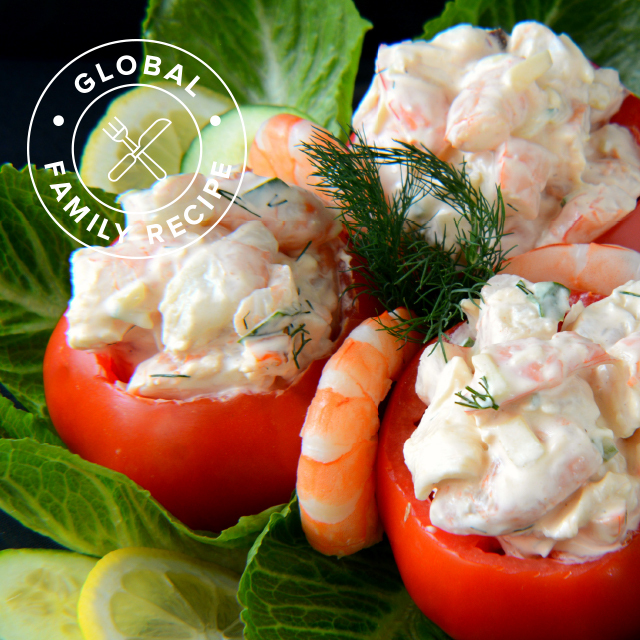 Spoon the shrimp salad into each of the tomatoes and garnish with dill. Top with the tomato “lid” and serve on a bed of salad greens. How’d it turn out? Share your recipe success with #goaheadtours on Instagram!